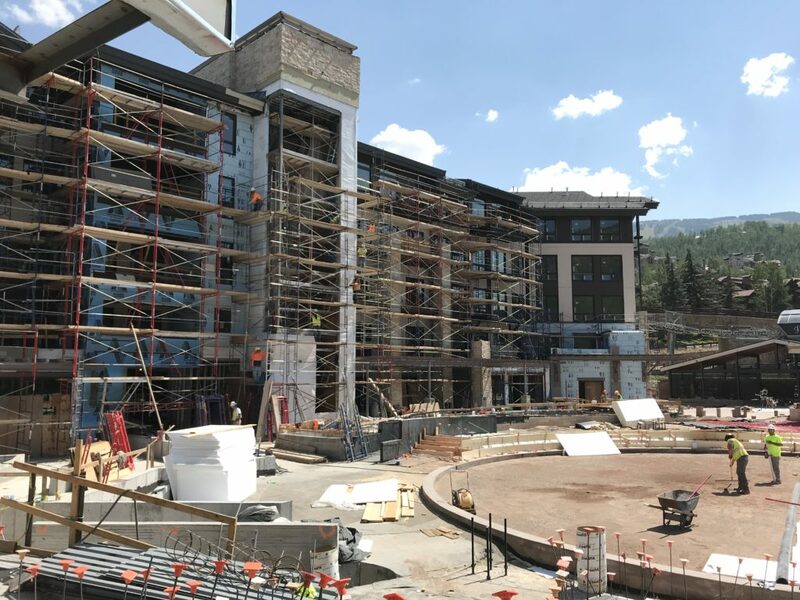 Summer is certainly zipping by, and we thought it the perfect time to update you on the exciting progress we’re making on the new Snowmass Base Village! All hands are on deck with five major projects now underway, including the Limelight Snowmass Hotel and Residences, the Lumin Residences, Village Hall (Building Six), One Snowmass (Buildings Seven and Eight) and the new public plaza. The Limelight Hotel and Residences, Lumin, public plaza and core elements of Village Hall are on track for a November completion, and we’re looking forward to the community-wide grand opening celebration of the Base Village and Limelight Hotel on December 15 – be sure to mark your calendars! • Reservations are now being taken for the winter season beginning January 4, 2019. • Only five residences remain unsold and feature two- and three-bedroom homes! • Approximately 65% of the 99 hotel rooms have interior finishes complete, including carpet, beds, finishes and furnishings. • Nearly all the scaffolding has been removed from the mountainside exterior, and it is exciting to get a glimpse of how the hotel will look when complete! 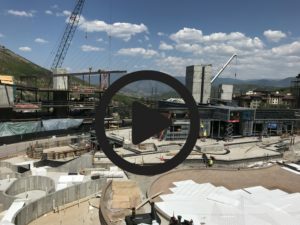 • The final push is underway on the public spaces and amenities such as the lobby, Limelight Lounge, Snowmass Mountain Club, spa pools and kids’ room. • The five-story, glass-enclosed climbing wall is 95% complete – it looks fantastic and very TALL! • Only two residences remain unsold in Snowmass Base Village’s most exclusive building. • Interior drywall, as well as bathroom and kitchen finishes, are nearly complete, including the millwork on 15-foot long kitchen island – the centerpiece of these amazing gourmet kitchens! These homes are really taking shape and now is the perfect time to take a tour. • Great progress is being made on Lumin’s plaza-level commercial space, which will be home to ASC’s Four Mountain Sports, plus a fun crepe restaurant that will be announced soon. • Structures for the children’s splash pools, ice rink and gathering spaces have been constructed. • Pavers are being installed throughout the area and will be heated for easy skier access. • The Ice Rink is now under construction, including the concrete and mechanical systems. • Events and activity planning for the public plaza is also underway – look for music concerts, farmers market, family activity nights and more to be announced soon. • While this building will not be open for this coming ski season, we are looking to have an inviting outdoor bar this winter to activate this corner of the plaza. • The remaining work on the building’s interior will take place throughout the winter for a summer 2019 opening. • Snowmass Base Village will operate the majority of Village Hall with an exciting collection of family fun amenities, including a restaurant and kids’ game room. • The Snowmass Discovery Center will also call this unique building home. • We’re 85% sold out of the Viceroy Residences, having sold more than 40 homes since the purchase of the Base Village. • The renovation of the Nest outdoor dining experience with a poolside, ski-in/ski-out bar, as well as two new huge cascading spa pools will be complete soon. Guests are already enjoying the many improvements. • A comprehensive room and corridor refresh is underway with the design phase complete. An image packet and prototype model residence is completed for viewing by all. • This winter we are looking forward to announcing an innovative new partnership that will represent the next evolution in purchasing whole ownership mountain resort homes. • Construction of One Snowmass West (Building Seven) and One Snowmass East (Building Eight) is progressing rapidly. Both buildings will be enclosed by winter with an anticipated summer/fall 2019 completion. Interested in a tour of the plaza to see the construction progress first-hand or to learn how you can call Base Village home? Call us today at 970.924.9100 or email us.